The weekend may have started in a sombre mood with the news of the passing of F1 director Charlie Whiting, but that didn't stop Valtteri Bottas from commanding the Australian GP in his Mercedes. Valtteri Bottas made a flying start off the grid to overtake a slower Lewis Hamilton on pole position into the first corner. He never looked back, finishing in front of his Mercedes team-mate at the season-opening Australian Grand Prix and taking the new bonus point for the fastest lap. After the race, the Finn said, "I don't know what just happened," and, considering the season he had last year, many of his naysayers might have been thinking the same. 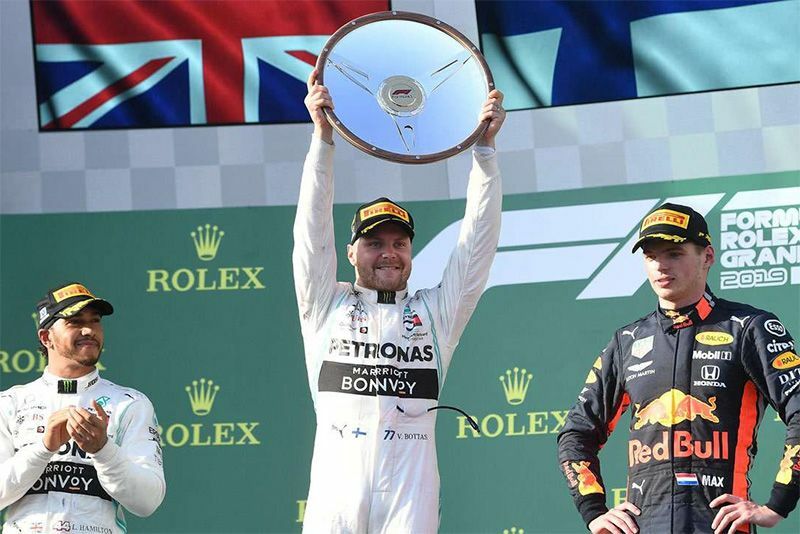 What has been made very clear is that Bottas hit the reset button during the off-season and has a renewed focus on winning races. Hamilton, though, was not as convincing. By lap 15, he was 3.8 seconds down on the Finn as Mercedes brought him in for a pit stop in reaction to Ferrari's Sebastian Vettel doing the same. This meant that he would have to maintain his tyres if he was to get them to last the race. Ultimately, he finished 20 seconds behind his Bottas while battling off the Red Bull of Max Verstappen for second place. Ferrari, who were assessed to at least be on par with the Mercedes cars going into the weekend, ended nearly a minute off the pace in fourth and fifth place with their debutant, Charles Leclerc, hot on the heels of Vettel. "Why are we so slow?" Vettel asked over the radio as they entered the last third of the race, to which Ferrari replied sombrely, "We don't know at the moment." While the Italian team struggled to get the full performance from their cars, the Monegasque, Leclerc, managed to close in on his team-mate thanks to fresh tyres from a second-half stop. Vettel had said before the weekend that they were free to race but Leclerc appeared to back off once he had closed on his team-mate. Mercedes team boss, Toto Wolff, described Bottas' drive as "one of the most dominant victories in recent days". Hamilton: "It is a good weekend for the team. A really fantastic job from everyone. Valtteri drove an incredible race and he really enjoyed it. Lost position at the start, that was a little disappointing, but I will just train and work hard for the next one." Verstappen: "Happy to pull that move off and then challenge Lewis for second. Pretty pleased with that. To start the season on the podium challenging the Mercedes car ahead is a great start for us." Bottas: "I don't know what just happened. I don't know what to say. The start was really good. It was definitely my best race ever." He also said, "Thank you, Charlie. This win is for Charlie and all his work in F1. He has done massive amounts, so thanks from all us drivers," referring to the death of F1 director, Charlie Whiting (66), who was one of the most influential people in the sport. Click here to see the race highlights.